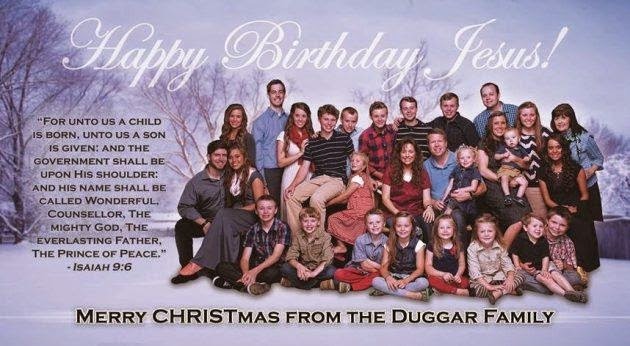 The Duggars from19 Kids and Counting have just released their CHRISTmas card, and it's all about Jesus! The parents Jim Bob and Michelle Duggar may not have added another child to their 19 children, but the family continues to grow with three children-in-law, and three grandchildren. Jim Bob's mom, Mary also joins them for the family picture. In addition to their family pic and "Happy Birthday Jesus! ", the card also features the greeting "Merry CHRISTmas From the Duggar Family," as well as a bible quote: "For unto us a Child is born, unto us a Son is given: and the government shall be upon His shoulder; and his name shall be called Wonderful, Counsellor, The Mighty God, The Everlasting Father, The Prince of Peace." Michelle Duggar had explained on her TLC blog last year that she and Jim Bob try very hard to keep their kids focused "on the real meaning of Christmas," and not on Santa or presents or any of the other more commercial aspects of the holiday. "It was Christ's day, the holy day of mass, Christ mass, and what we're celebrating is the day that Christ was born," she wrote. "We explained that to them from the beginning and how it is a huge celebration. We really make it a big deal...It's an exciting time. We decorate. It's a big birthday party for Jesus." What fascinates me, apart from one woman having so many children, is that all the kids have 'J' names - from oldest to youngest: Josh, Jana, John David, Jill, Jessa, Jinger, Joseph, Josiah, Joy-Anna, Jedidiah, Jeremiah, Jason, James Andrew, Justin, Jackson, Johannah Faith, Jennifer Danielle, Jordyn-Grace Makiya, and Josie Brooklyn.